LED lighting and mirrored bottom cast a beautiful light on merchandise making it more appealing. Coordinates with Grace Tyler display series to create multiple configurations. Cabinet ships fully assembled for immediate use upon arrival. 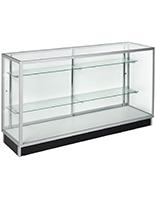 Full vision display case with (2) stationary shelves stands at 42"h, 4" taller than traditional counters! 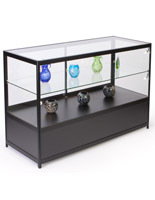 Constructed from MDF with a black semi-gloss finish and tempered glass, for a sturdy and attractive retail counter. 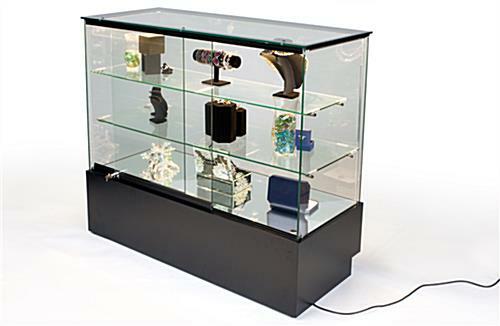 Retail merchants use this glass jewelry showcase with LED lights in their establishment, as this type of lighting is more energy efficient for store use, and is a great way to present merchandise in any upscale retail establishment. 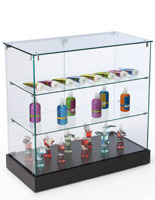 Each full vision, product display cabinet stands 42" in height, approximately 4" taller than most traditional counters. This height allows customers to easily view merchandise inside the case, without having to bend too far down. 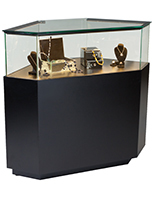 An LED-lit glass jewelry showcase, such as this retail counter, is constructed of black MDF and features tempered glass sides and sliding rear doors. These products are sturdy, durable and ideal for commercial use. 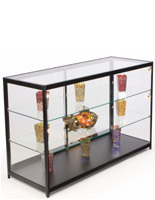 This locking glass jewelry showcase features sliding glass doors that include plunger locks, keeping all merchandise inside the presentation counter safe and secure. 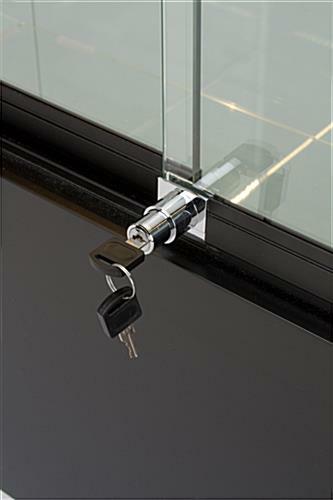 Sliding doors also provide easy access to items displayed within the counter. 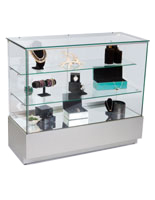 This commercial cabinet, full vision glass jewelry showcase with LED lights, can be used in multiple configurations with other store cases to build the desired layout. Each cabinet features (2) glass shelves, providing the display counter with ample space to create unique and visually appealing displays. 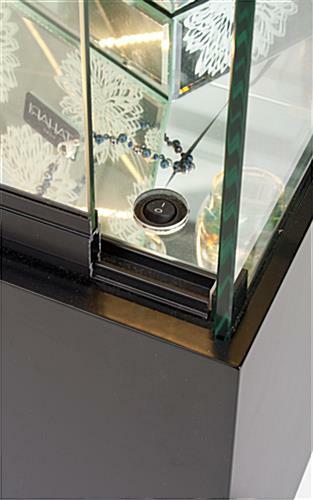 This full vision glass jewelry showcase features a mirrored bottom that reflects the lighting. LED illumination helps to cast a favorable, more natural light on all displayed items. 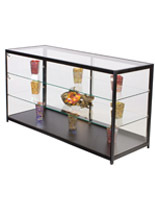 This glass jewelry showcase with LED illumination accentuates any upscale and fashion-forward retail setting. Shipping fully assembled, this cabinet is ready for use as soon as it arrives at the commercial store! 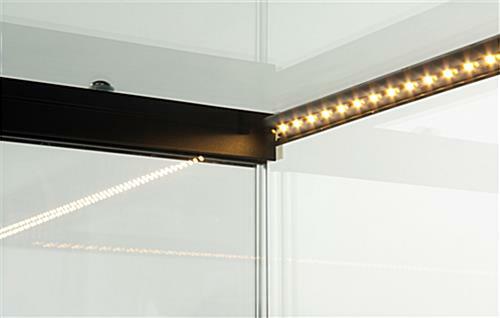 Each locking glass jewelry showcase with LED lighting features a black base, elevated off the ground by (4) floor levelers. These levelers ensure that each case can be placed on slightly uneven surfaces, while remaining level and stable. 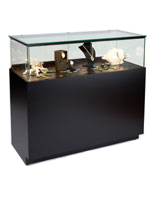 This display counter, LED-lit glass jewelry showcase is fabricated from durable MDF and features a recessed toe kick. 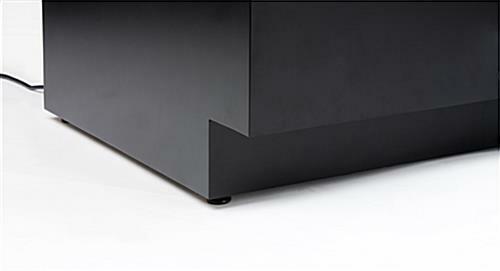 This ensures the bottom of the case will not show any visible signs of accidental scuffing or other damage caused by foot traffic near the display cabinet. 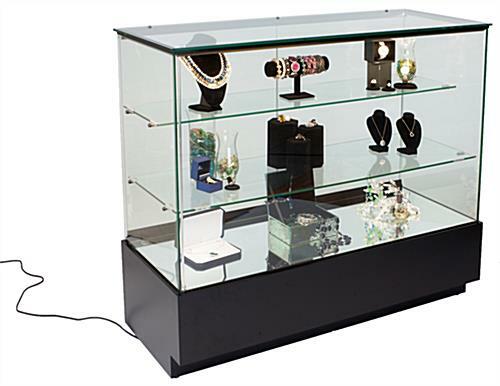 This full vision glass jewelry showcase with LED lights is ideal for upscale retail environments, and is sure to display store merchandise stunningly! 47.5" x 42.0" x 17.5"
47.5" x 12.3" x 20.0"
It shipped to my front door in a wood craft container, very secured packaging. The cabinet I use for my Japanese swords collection look beautiful and very professional with not so bright LED light that what I want. I wish they are dimmable , the glass is thick (3/8 inch). I minus 1 star because high shipping cost. Any way I m happy with the purchased. Next time I may order a taller without LED so I can Install dimmable set. We're glad you're satisfied overall with your purchase, Trong! We'd love to see a photo of your display sometime, too! Thanks for shopping with us.